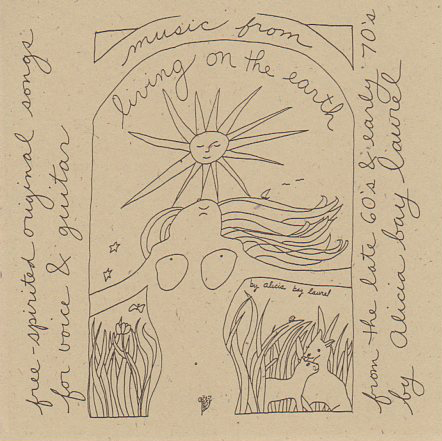 Posted on May 21, 2007 by Alicia Bay Laurel	in Blog and tagged travel diaries. I spent April 25 and 26 flying from LA to Tokyo, and was kindly met at Narita International Airport by my friend Koki Aso. Between the gasoline and toll roads, the round trip cost him about $70. I pressed newly minted yen from the airport money changer into his hands, but he took little of it. The patience and generosity of this man in monumental. 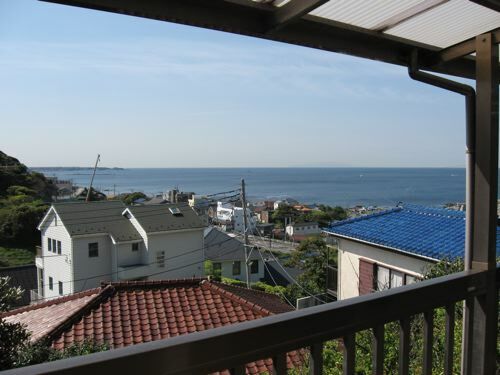 Upon awakening from eight hours of deep slumber on a floor futon in Koki’s home office, I dug the view of the ocean and hills of Hayama (HI-ah-mah) from Koki and Ayako’s second floor balcony. 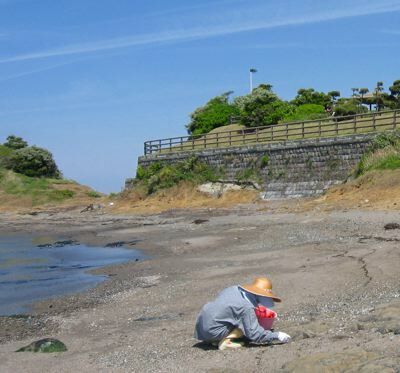 They live in a very Japanese house on a steep hill, only two blocks from the beach. I love it here already. The Japanese take their cherry blossoms (which they call SAK-ur-ah) very seriously. 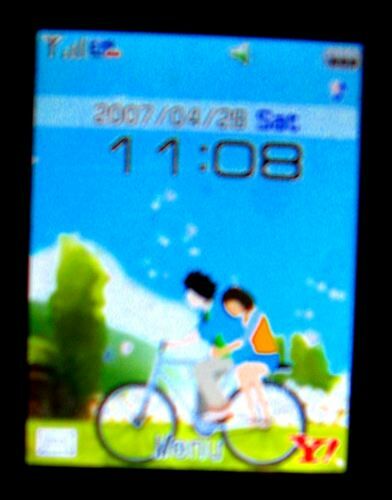 Even the animation on my rental cell phone screen shows a young couple bicycling through a shower of cherry blossoms, and Ayako thinks that, as the seasons change, the animation will be changed to match. 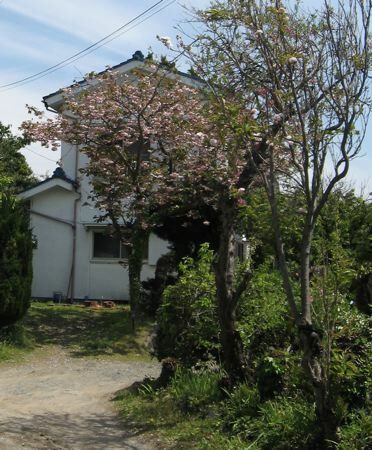 The cherry tree in front of Koki and Ayako’s house is blooming a little later in the season than most. They are pleased I came in time to see it. 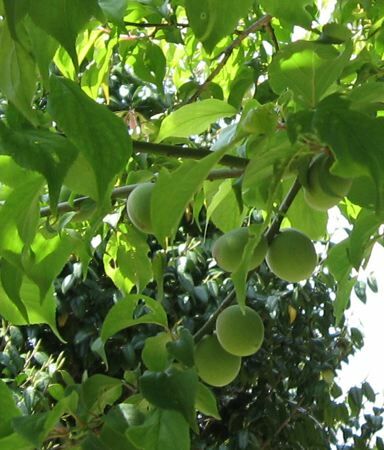 The plums bloom in March, and already there are ume (pronounced OO-may) (plums) that Ayako will use to make umeboshi (salted pickled plums), a fabulous condiment whose vinegar I use to make tofu taste like cottage cheese or yogurt (depending on the texture of the tofu). I couldn’t wait to take a walk around the neighborhood, and Ayako kindly obliged me with a tour. 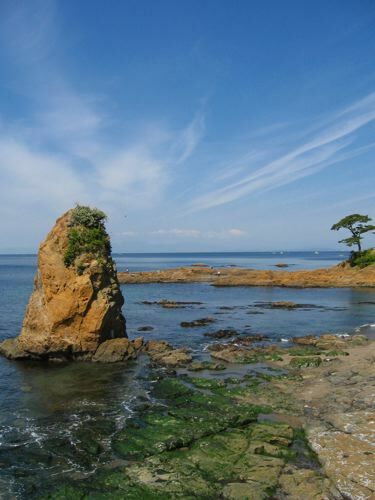 At the end of the street where they live, a Shinto shrine (called a JIN-ja) overlooks the ocean. 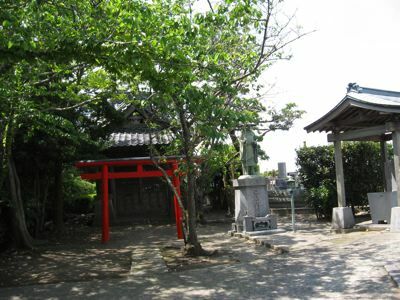 The red torii (TOHD-ee-ee) (gate) is the dead giveaway it’s a Shinto shrine rather than a Buddhist temple, although some places of worship in Japan combine both religions. 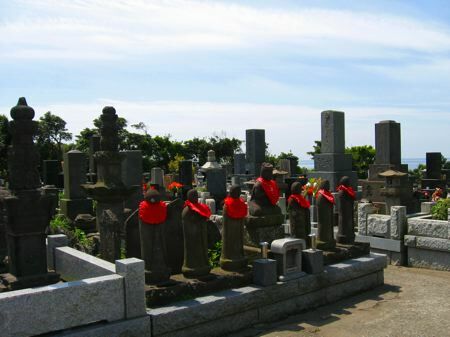 Ayako was as stumped as I was as to why the shrine’s funerary statues wore red bibs. 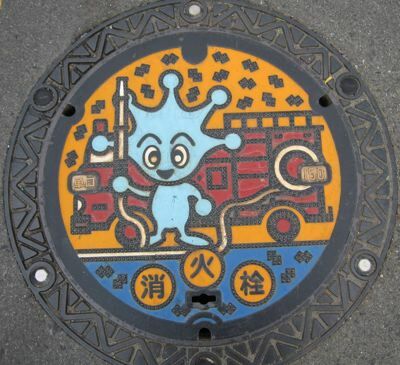 I picked up where I left off last trip to Japan, photographing their creatively designed manhole covers. 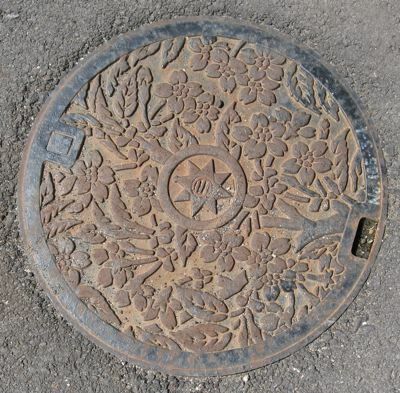 Have you ever seen one in the USA with cherry blossoms on it? Hayama’s got ‘em. Lordy, here’s one with an alien on it! 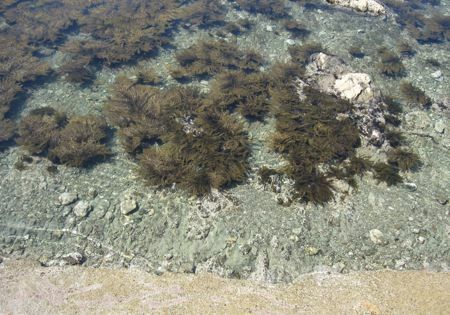 Looking down from the seafront street, we gaze upon gardens of sea plants swaying in the amazingly clear water (considering that Hayama is one of the closest beaches to the mega-metropolis of Tokyo). 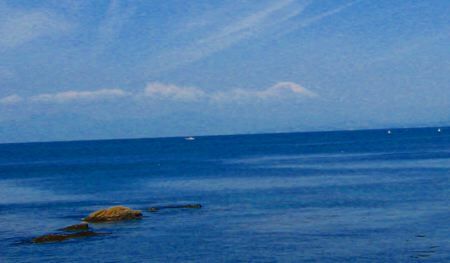 And, across the water, snow-capped Mount Fuji rises above the clouds. I had to disproportionately increase the color depth on this shot to make it more visible, since the air was hazy. But, I mean, isn’t it, like, HUGE? 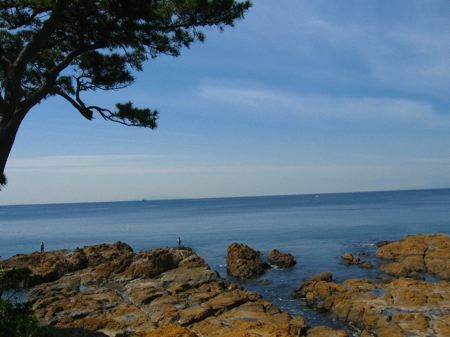 We walked in Standing Stone Beach Park. A smiling lady dressed in farming clothes was out gathering shells. 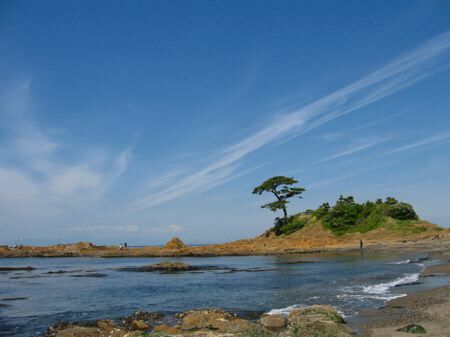 …and beloved Oshima island is barely visible on the horizon as well. 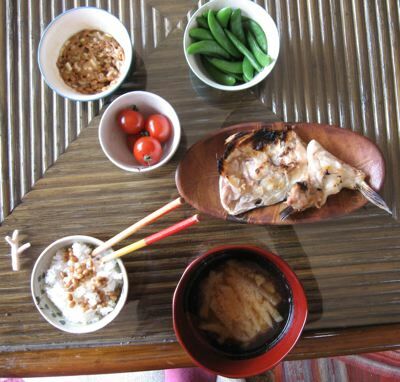 Ayako prepared us a gorgeous, healthful breakfast when we returned to her house: grilled saba fish, freshly picked cherry tomatoes and peapods from their garden, nattoh (sticky fermented soybeans, an excellent fortifier), a richly flavored tea made from roasted black soybeans from Hokkaido, and miso soup with daikon (long white radish) in it. 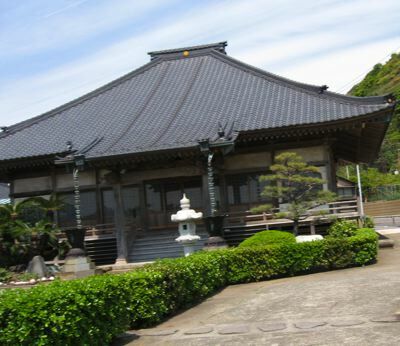 When I eat traditional Japanese food, I feel so good that taking vitamins and other supplements becomes superfluous. The next morning, Ayako sent me off to Haneda airport with a packed picnic lunch of individually wrapped small treats on a small tray wrapped in an elegantly printed large cloth napkin: pickled cabbage, homemade umeboshi, two cherry tomatoes and three peapods, half a hard boiled egg, two rice balls riddled with sea vegetables, and a small portion of grilled chicken. Ohashi (chopsticks) included! 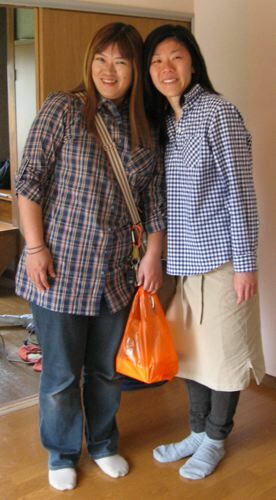 Mari (on left), Ayako’s friend, came over, and they went out for a while together, leaving me alone to practice vocal technique exercises without disturbing anyone (Koki’s at work today). Ayako’s husband, Koki Aso, is the journalist who came to Hawaii to interview me for Be Pal outdoor living magazine in May 2005 and determined to help me tour here in 2006. He managed to convince the people at Artist Power Bank, an environmental arts organization in Tokyo, to fund my trip and put on two concerts and a workshop for me. 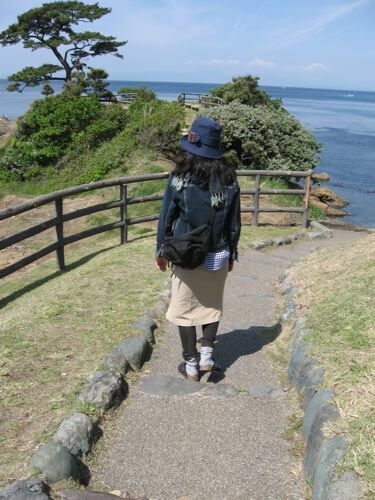 I then contacted my other friends in the music business in Japan and cobbled together a four-week, eight-concert tour in October 2006, all of which is journaled on this blog (look in the left column under “Tags,” click on “Japan,” and all of the entries will come up in reverse chronological order). During the October trip I met the organizers of two music festivals, who each invited me to play at them this May, so this time I bought my own plane ticket and am performing sixteen times in seven weeks, selling the Japanese editions of my books and CDs as I go.